More words to empower you! 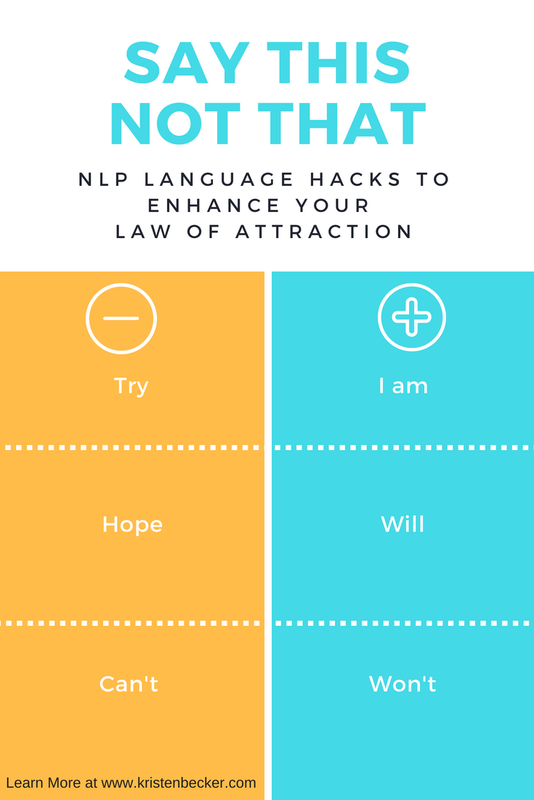 You may be asking yourself, “what is NLP and how can I use it to enhance the law of attraction?” Well, I have stellar news for you. NLP is easy to use and rapidly tips the law of attraction scale in your favor. In truth, the law of attraction is a powerful force and is always in effect. Right at this moment, you attracting into your life, exactly what you believe in your subconscious mind. The problem is that thanks to years of passive conditioning and entrainment of your subconscious mind, most of what is in there is not aligned with your higher self and what you REALY want in your life. This is where NLP (nuero-linguistic programing) comes into play. Just as easily as your subconscious programming was developed though no creative control of your own (all of these years!) it can be reprogrammed according to your own choosing. Now how would you like to move from thinking and struggling to knowing and effortless flowing through life? The reality is that we were designed to do the latter. It’s just that years and years of adopting the mindsets, belief models and habits of those around us have created dis-empowering belief models and subconscious beliefs that do not serve us. There are literally hundreds of NLP strategies that you can easily adopt into your daily habits that will change your belief models and in turn, what you are attracting into your life. One of my favorites is the very simple act of adopting language hacks. The words you use are sending strong messages into the programming of your subconscious mind. Unfortunately, much of the vocabulary that we adopt is actually what is known as dis-empowering language. For example, imagine how your own attitude about what you are about to do changes when you switch from using the phrase "have to" to "get to" or even "want to"? Now notice how in that last sentence I did not say "if" I said "when"- see what I'm doing here? When you consciously switch your choices in words, you make great strides in shifting the programing of your belief models and the subconscious mind. If you say: I’m trying to get along better with my spouse. Why this is poor programing for your Law of Attraction: this tells your subconscious mind that your current state is not getting along well with your spouse and also that while an effort has been made there is no expectation of success- just trying, leaves lots of room for attempting to justify why this is not happening. What you focus on, you attract. Why this is poor programing for your Law of Attraction: Telling your subconscious mind that luck, hope, wishful thinking is your only small chance- this one is right up there with maybe… which usually means no. hope is on the edge of the lower vibrating emotion of fear and based in the law of resistance. Better: “ I have faith that everything is working out as it should” (power statement! Faith is a much higher vibrating emotion. With this statement you have given yourself permission to let go of worry and fear and opened up to an infinite number of possible positive solutions and outcomes ). When you become more consciously aware of your word choices you can then change them as well. Its all about becoming consciously aware of how deffective your own habitual speech pattern is and choosing to swap out words until it becomes automatice (your new way of thinking- yay!) After you do this several times, the new word choice becomes automatic and subconscious. you have then successfully reprogrammed yourself for that word or phrase and begun shifting your own mindset/belief model and hence what you are attracting to yourself- go you! Each time you speak (or think of what you are going to say) get in the habit of thinking about what message each word choice is sending to your subconscious mind. This is a part of your programming language. When you make shifts in the programming language you make shifts in your belief models which then effect what you experience and attract in life. There is a more positive alternative for almost every word. Here are some ideas to get you started. Imagine what type of life experiences show up for a person who constantly uses the word never? For example, imagine what type of life experiences show up for a person who constantly uses the word never? "things never work out for me" "I never get what I want". Ouch... its painful to even write it. Now imagine what type of life experiences show up for someone who says things like "My life is so interesting and full of great surprises" or " The universe has far better plans for me than I could ever make for myself". That last one is practically my mantra but I think you get my point. Language hacks are easy and fun, what words can you start shifting today? Are you looking to better understand and harness the power of the Law of Attraction? Come join us! The Law of Attraction Success System: Using Simple NLP offers live weekly workshops.